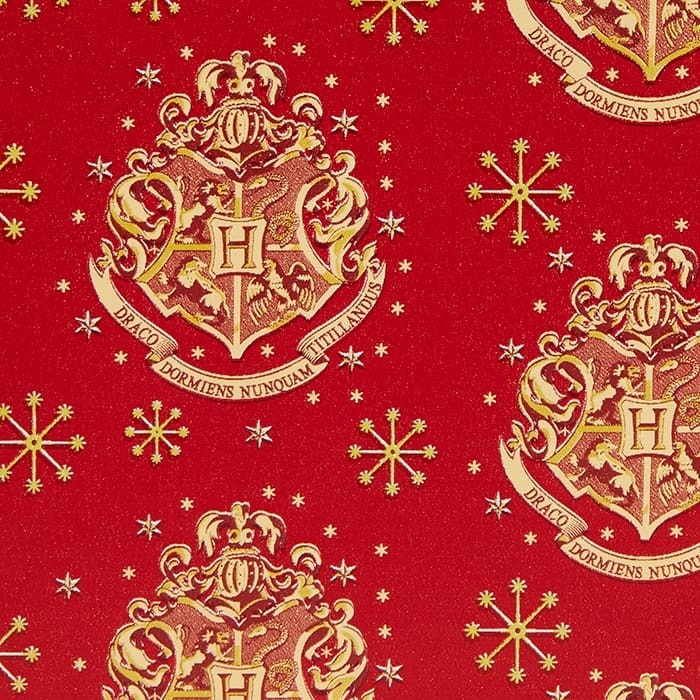 Harry Potter Wrapping Paper Brings the Magic to Christmas | Nerd Much? There are a ton of Harry Potter themed gifts out there that you could get a loved one for the holidays. But if that’s the route you’re going to go, you’ve got to complete the package in style – literally. That’s why this Christmas, Harry Potter Wrapping Paper is a must. This year’s Harry Potter Wrapping Paper comes to use exclusively via a joint effort between Think Geek and GameStop. When ordering, 2 rolls come within the package. One roll featuring the Hogwarts crest, and the other is a roll representing the infamous Platform 9 ¾ and Hogwarts Express. The Hogwarts crest design features a bright red base color that is emblazoned with a large version of the school’s logo in gold throughout. For accents, the Hogwarts crest Harry Potter Wrapping Paper also features golden stars/asterisks to help fill out the canvas. 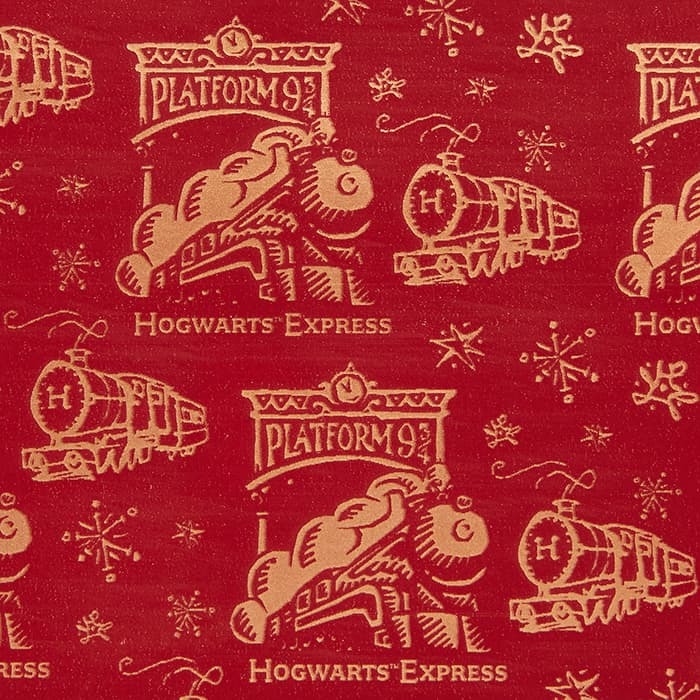 The Platform 9 ¾ and Hogwarts Express Harry Potter Wrapping Paper is similar, yet different, to the Hogwarts crest design. The base paper is a bit more of a darker, burgundy red than the other. It features a Platform 9 ¾ sign with a large image of the famous smoke billowing train rolling underneath. 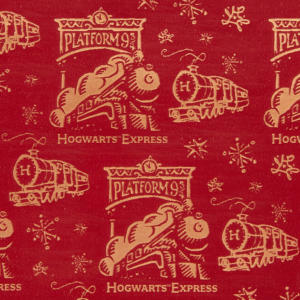 There’s also another train design with a smaller look at the Hogwarts Express here as well to help fill out the paper. Gold snowflake images are scattered around, too, for accents. 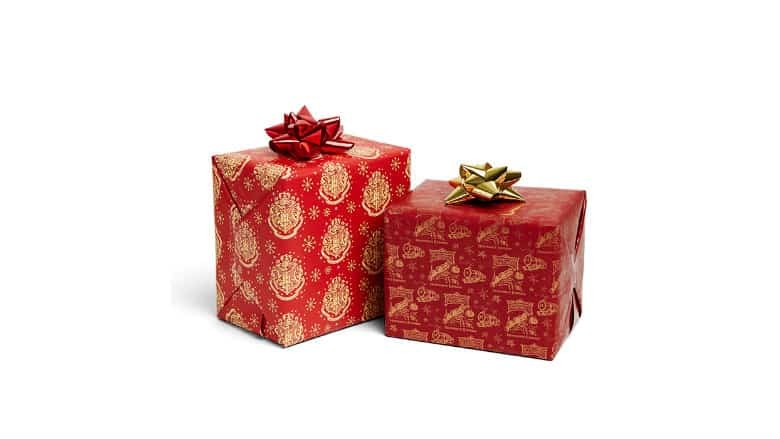 Each Harry Potter Wrapping Paper roll offers 20 square feet of gift wrapping paper to work with. They’re an officially licensed product too so the imagery and quality are legitimate. 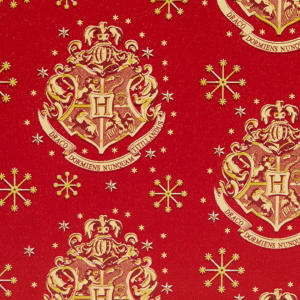 ThinkGeek has the Harry Potter Wrapping Paper on their site for a mere $14.99. While the Harry Potter Wrapping Paper is essentially a gift in itself, you’ll probably want to actually wrap something with it too. Perhaps a sweater? Or a cookbook maybe?